Last fall (2013 for those of you reading this in the future), I was approached by the Holocaust Center of Pittsburgh to serve on the steering committee for a project they wanted to create. The history of the Holocaust is horrific, but they wanted to find a way to celebrate the lives and stories of people who stood up against Nazi oppression and made a difference. The basic concept they had in mind was to utilize the metaphor of the Superhero to talk about real people who did heroic things during the Holocaust. This might sound, at first, like a strange idea, until you realize that most of the writers, artists, and creators of superheroes and comic books in the 1930s and 1940s were Jewish. Superman, Batman, Captain America and dozens of others of these brightly colored heroes first appeared at the exact same time as the events of the Holocaust that led up to World War II. The Holocaust Center worked in conjunction with the Pittsburgh Toonseum. I was recruited in my role as Resident Comics Scholar and Comic Book Historian for the Toonseum. Initially I thought my primary function was to offer them knowledge and research on the topic of comics of the time period. As the project grew and took shape my role expanded (not that I am in any way solely responsible for the project... lots of talented and motivated people took part in bringing this to fruition). This blog is a brief introduction to the project. There will be future entries that explain some of the pieces of this in more detail. In our early meetings I learned the word Upstander, a term that is used to describe anyone who stood against the Nazi regime. I inadvertently named the project. We were brainstorming ideas for a name and I jokingly said “Chutz-Pow!” with the emphasis on the POW part because it's a comic book sound effect. I thought it was over the top, but everybody loved it. So, Chutz-POW! : Superheroes of the Holocaust was born. There are three phases of Chutz-POW! (at least as I see it right now... this is designed to be an ongoing and evolving project that could last for years. I know the Holocaust Center has other plans for the future of this, but for right now there are three I want to talk about). Phase one is a museum display focusing on the early history of comics and the symbolic connections of the Superhero with the Upstander. This display will feature information on international Upstanders accompanied by comics style artwork by a number of local Pittsburgh artists (I'll talk about this more specifically in a future blog). This display premieres this weekend at the annual 3 Rivers Arts Festival running June 6 through the 15th. Though my primary role in this project has been as a writer I contributed a piece of comics art for this display. 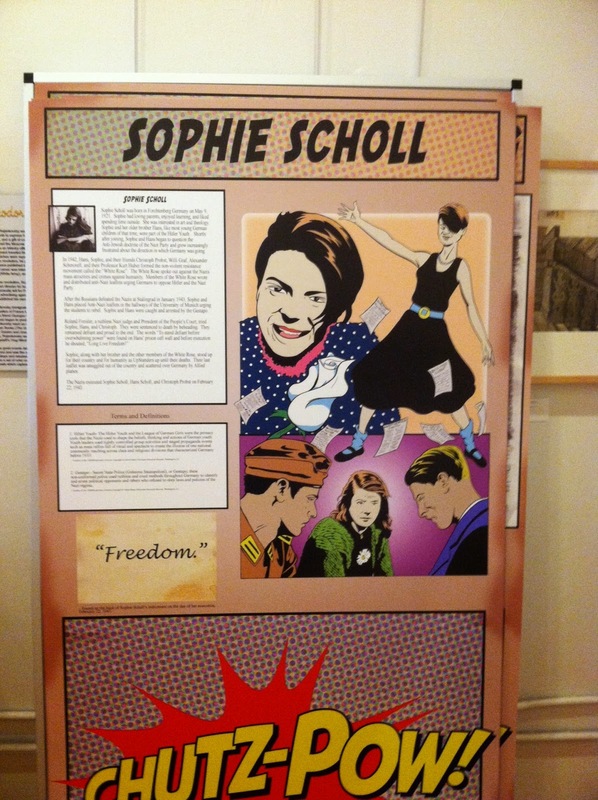 I was fascinated by the story of the Upstander Sophie Scholl and chose her as the subject of my page. For more info on Sophie her Wikipedia page is a good place to start, but there's a lot more. I'll be blogging more about her as well. original art in my next blog when I talk about this process. The museum exhibit is designed to be displayed at other museums in the future. It will be on display at the Pittsburgh Toonseum later this summer. There are plans for it to appear at comic book conventions and, if all goes well, at the Holocaust Museum in Washington DC, and perhaps even in a museum in Israel. Phase two of Chutz-POW! is the part I was most involved in. We decided that it would be a good idea to produce an actual comic book. My experience as a writer and a comic book creator, as well as my background in research, made me the obvious choice to be the writer on the project. I also know a lot of the local comics artists and have good working relationships with them, which is essential in a project like this. The comic tells the stories of five local Pittsburgh Upstanders and is in the final stages of completion as I write this. It is scheduled to be published and available later this summer, so I will talk about that in more detail when the time comes. Phase three is the part I have the least involvement with. The Holocaust Center plans an educational program where the comic will be utilized in middle schools and high schools as an aid in teaching the Holocaust. This will be an ongoing program. In the meantime, go check out the Chutz-Pow! exhibit at the 3 Rivers Arts Festival! Addendum: I wrote an intro for the Museum Exhibit that ended up not being used in its entirety due to space limitations on the display. I really like it, so I'm posting it below. This serves as a pretty good introduction to the ideas we have been working with over the course of this project. While the concept of the Hero in fiction dates back to antiquity the modern genre of the Superhero was born with the first appearance of Superman in Action Comics #1 in 1938. The ideas that we most associate with the superhero were all present in that first thirteen page story: a brightly colored costume, a secret identity, and powers and abilities beyond those of normal men. Superman was a character that would forever change the world of heroic fiction and inspired a legion of characters that show no signs of abating. Superman was the creation of Jerry Siegel and Joe Shuster. The two Jewish teenagers originally conceived of the character while living in Cleveland. By the time Superman first appeared they were working regularly as a writer and an artist for National Periodicals, the company that would one day become DC Comics. Many of the earliest creators of the comic book industry were Jewish. The man who created the format of the modern comic book in 1929 was Max “Ginsberg” Gaines. National Periodicals was founded as a publishing company by Harry Donenfeld and Jack Liebowitz. Creators like Will Eisner, Jerry Iger, Joe Simon, Jack Kirby (Kurtzburg), Stan Lee (Lieber), and Bob Kane became the foundation upon which the entire comics industry was built. Like most Jewish families living in America in the 1930s they heard stories of what was happening in Germany under Hitler and Nazi rule. Jewish heritage, culture, and political awareness could not help but find its way into the art they created. Superheroes were calling for American intervention in their stories for months before the start of World War II. The most famous example of this is the cover of Captain America #1 (by Joe Simon and Jack Kirby), where the good Captain is seen punching Hitler in the jaw. This was published in March, 1941, months before Pearl Harbor and years before American troops set foot in Europe. The superhero became enormously successful in a very short period of time. In the last days of the Depression with another World War looming, it was a time in need of heroes. These characters served as an inspiration. Though they had powers beyond that of normal humans, the lessons they taught were available to us all. Do the right thing. Stand up for yourself and for those who can't stand up for themselves. Recognize evil and stand against it. Fight for what you believe in if that cause is just. They were easily understood metaphors for everyone who read them. The stories of superheroes covered the pages of magazines in brightly colored glory, but the truly heroic acts of that era were accomplished by very real human beings, many of whom will never be celebrated or even known. The Chutz-Pow! exhibit is an attempt to share the stories of some of these real life heroes. There were no costumes or special powers. They were simply men and women who stood up against evil. If the superhero is defined by his ability to inspire others to heroic actions then these men and women are superheroes indeed. Their lives are proof of a simple truth. We can all stand up. We can all be heroes.